The recession of the mid 1970s was the back-drop to my early teenaged years. When not blacked out by power cuts the television was full of stories about strikes and trade union militancy. 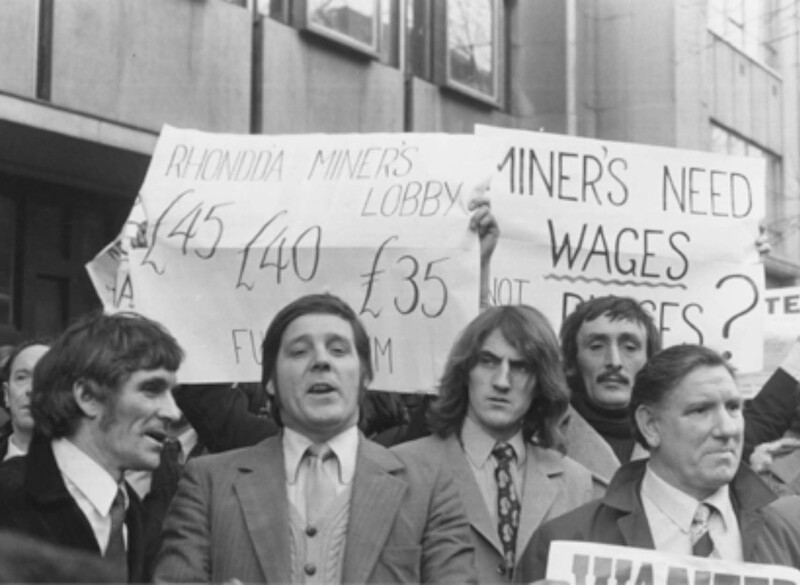 The recession had been triggered by the 1973 Oil Crisis and the miners strike later the same year. In January 1974 the Conservative Government imposed a state of emergency. Very soon we were in the three-day week and the country was plunged into an uncertain world of power cuts and strikes. The British economy – already branded the ‘sick man of Europe’ – was struggling under the burden of 20% inflation, unemployment of more than a million and a huge national deficit. 1974 saw two elections, the first of which resulted in a hung Parliament and the second a majority of three for Labour under Harold Wilson. It is hard today to imagine, but there were very real concerns at the time that London was a city in danger of dying. The early 1970s saw the closure of many of the city’s docks causing the number of dockers to fall from 60,000 after the war to just 30,000. Unemployment in London doubled between 1970 and 1976 reaching 7.2% and the population fell below 750,000. 1973 saw a Labour administration elected in the Greater London Council but high inflation and the oil crisis forced them to raise rates by 200% and the Labour group eventually split with a radical left wing group breaking away led by the unknown figure of Ken Livingstone. The 1970s were turbulent times in London full of political struggle and conflict. The Barbican was opened at the start of the decade and the political and professional view was that London’s fabric needed to be updated and ‘modernised’. The great battle of the era was fought in Covent Garden, a district laid out by Indigo Jones in the early 17th century on the kitchen garden of Westminster Abbey. The Fruit and Vegetable market that had traded on the site since 1649 was widely agreed to have become impossibly congested and inefficient. 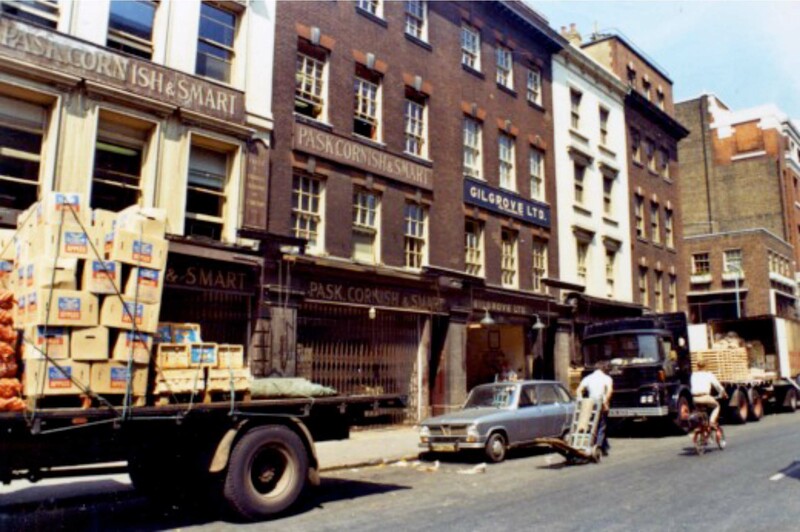 A decision was taken in 1971 to relocate the market to Nine Elms and in 1974 Covent Garden was vacated. The old Covent Garden Market (above) was relocated and plans drawn up for a Barbican-style redevelopment. This is the only image I can find of what was planned. The GLC, which had inherited the freehold beneath much of Covent Garden, started planning for the redevelopment of the area a soon as its closure was announced. Its plans were very much of their time and the aim was nothing less than comprehensive redevelopment of some 75 acres of land, with high-rise offices and grade-separated roads. It was a plan drawn up by the Conservative GLC but supported their Labour successors, by Conservative Westminster Council, by Labour Camden Council and by National Government of both colours. The only dissenters were ‘a motley vociferous collection of locals who had no evident power or influence’1. This motley crew in the form of the Covent Garden Community Association chaired by the Reverend Austen Williams, was the lone voice of dissent at the 1972 public enquiry into the proposals. They were ridiculed by the barrister for the GLC as ‘fanatics standing in the way of progress’ and they faced an almost total political consensus ranged against them. Following their inevitable defeat at the enquiry, the campaign took to the streets, staring with a huge demonstration in Trafalgar Square in 1973 followed by a campaign of civic disobedience. Protestors set up a picket outside the Mayfair home of Lady Dartmouth, the chair of the relevant GLC committee, they occupied offices, disrupted press conferences, squatted buildings at risk of demolition and generally caused as much nuisance as possible. Many years later I was interviewing architects for the Homes for Change housing cooperative in Hulme in Manchester. One of the interviewees was MBLC Architects and their presentation, led by George Mills, opened with a black and white slide of a press conference of the Architects Revolutionary Council in Covent Garden in 1975. The ARC was a group of students from the Architecture Association led by their tutor Brian Anson. He had formerly been principle planner at the Greater London Council and had been sacked for ‘taking up cudgels’ on behalf of the Covent Garden Community Association in 1971. The ARC’s manifesto proclaimed that architects should immediately stop working ‘only for a rich powerful minority or the bureaucratic dictatorship of Central and Local Governments and offer [their] skills and services for the local community’. There amongst the committee arranged like the Last Supper behind a long table with long hair, sideburns, velvet jackets and sunglasses sat George. Needless to say MBLC got the job. The Architects Revolutionary Council meeting in Covent Garden – George being the third from the right. Unthinkable as it had seemed in 1972, the campaign was eventually successful. By the mid 1970s the national mood had changed and in 1974 the Conservative Secretary of State Geoffery Rippon was persuaded to List 250 buildings in the Covent Garden area forcing the, now Labour, GLC to rethink its plans. 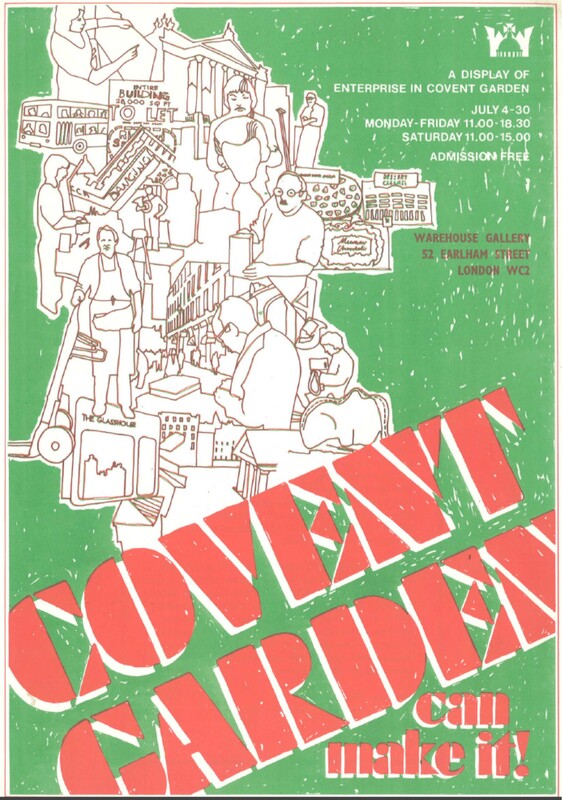 There followed a difficult period of cohabitation with the Covent Garden Community Association and the GLC sitting together on the Covent Garden Forum, a body that lasted until 1978 when the community withdrew their support. 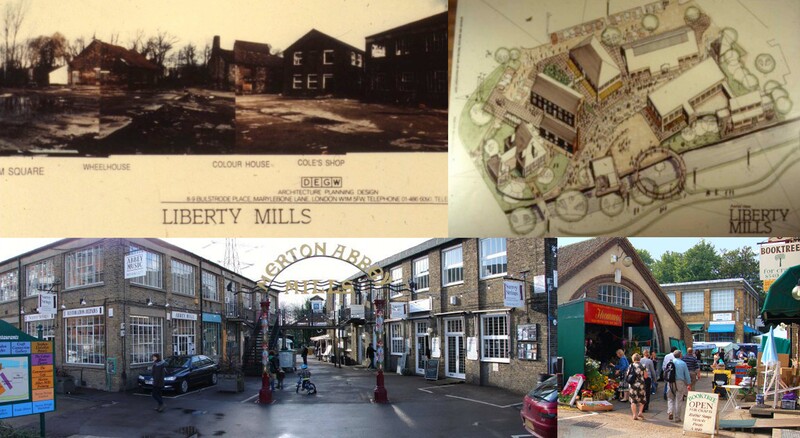 However an Action Plan was agreed in 1978 to renovate rather than redevelop the district with the old market being converted to a speciality shopping area that opened in 1980 and the rest, as they say, is history. The story of Covent Garden is however not just one of political strife and community action. The battle for Covent Garden was won not just through marches and occupations. What also happened was that the area was colonised by creative business in the years following the closure of the market. It was a neighbourhood that had become vacant during of one of the bleakest economic periods that the UK had ever faced, yet it filled up rapidly with small businesses and creative industries attracted by the cheap rents, the heady atmosphere of dissent, alternative culture and an increasing concentration of like-minded people. It was this burgeoning of economic activity as much as the political campaigning that the argument about demolition. A debate that started as a discussion about the demolition of vacant building evolved into one about extinguishing a thriving business community. My company, URBED was founded in Covent Garden at this time. Two former management consultants, Nicholas Falk (McKinsey & Company) and Christopher Cadell (Boston Consulting Group) set up URBED to apply business ideas to the process of urban regeneration. With help from John Worthington on the design side and Ronnie Lessem on enterprise development, they used Covent Garden as a source of ‘action research’ and as a testbed for ideas such as the adaptive reuse of old buildings, and training for entrepreneurs. One of the first initiatives was to set up a Space Exchange to put creative businesses in touch with building owners, and an exhibition revealed what was really going on. Today these would be called Meanwhile (or ‘Pop-up’) Uses. Our research discovered some 1500 businesses employing 30,000 people in eight or nine clusters. We pioneered the idea of ‘working communities’ an idea that David Rock pioneered at 5 Dryden Street which developed into the ‘managed workspace’ movement. The businesses that populated the shabby staircases and vacant floors of Covent Garden were the vanguard of a creative economy that would eventually transform the whole of London. The story of Covent Garden is shared by other districts that emerged through a similar baptism of conflict in the 1970s. The North Laine in Brighton was a humble neighbourhood of terraced houses threatened with demolition to build an urban motorway. The area was occupied on a temporary basis prior to demolition by another ‘motley collection’ of radicals and creatives who, having fought off the road scheme, became the nucleus for a creative quarter that thrives to this day (in a way that Covent Garden, struggling under the feet of tourists and buskers has not quite managed to do). However perhaps the best example of a creative quarter to emerge from the dark days of the mid 1970s is Camden Lock. Like Brighton this was the ‘victim’ of a proposed road scheme. There were plans in the 1960s to complete a London motorway box by linking the Westway through north London on the line of the Grand Union Canal. The canal would have disappeared as would much of Camden under a motorway junction. In the early 1970s the canal wharfs and railway arches of the area were blighted by the prospect of this scheme so that British Waterways were happy to grant a seven year lease to Northside Development Ltd. a company formed by Peter Wheeler and Bill Fullford initially to do up vacant houses but which was looking for a commercial opportunity. They gambled that the road scheme would be dropped opening up the prospect of a proper redevelopment. However in the meantime they had to make a return from the site with uses that could be easily removed if the motorway scheme materialised. To do this they found (or were found by) a 27 year old called Eric Reynolds. As he says; ‘there was an explosion of arts and crafts in the Sixties and Seventies, but there were few places for people to sell their wares. I walked round London looking for an open space and came across this yard. In the week, it was a printers’ delivery yard, we got a short lease and on Saturday, March 4, 1974, we opened. There were 40 stalls, which we let out at £3. They were mostly craftsmen and artists – silversmiths, people selling home-made buttons, knitted children’s clothes, plus a woman who sold decorated traffic lights and milk churns. But the weather was appalling and we only got a few hundred people. Later that year, the canal was opened up. Then Sunday trading became legal, so the market opened on Sundays as well.’ The rest again is history, Camden Lock today includes a series of markets with more than a thousand stalls and has changed forever the character of Camden. It is now one of the most visited attractions in London and while it has been accused of selling-out and losing its authentic edge it remains a lively, boisterous place full of independent businesses. This scheme in Merton South London was done by Eric Reynold’s company Urban Space Management and URBED. The scheme involved the conversion of the old Liberty Silk Printing works to a market and creative workspace. Today when we use Camden Lock as an example of what could happen in some northern town, the response is generally, ‘ah well that’s different’, ‘it was never as run down as we are’ and, ‘in any case, it is in London’. The lessons from the 1970s suggest firstly that London as bad if not worse in the 1970s than many northern cities are today. But more importantly it tells us that it was this decline that created the conditions for Camden Lock and indeed Covent Garden to emerge. If the development market had been strong these areas would have been smothered glass and concrete. Space for diversity, and time to grow things incrementally wouldn’t have existed. Categories: Four Recessions | Tags: Covent Garden, London, Urban Regeneration, Urbanism | Permalink.